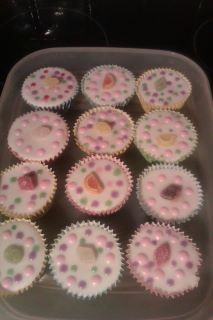 This week the call went out from my son's school for cakes for the Children in need cake sale being held this afternoon. As I was working all week I didn't really have time to create anything amazing or time consuming, so the old faithful cupcake recipe came out. This is the Victoria sponge recipe that lives in my head having been taught to me by my mum and various school home Ec teachers. See I did learn something at school! I did have to do a bit of substitution as I had run out of caster sugar, so used normal granulated sugar instead. The making of these was not all plain sailing as I had agreed to let my son help and we ended up with half an egg shell added to the mixture. Unfortunately for me, I was using the Kenwood chef so the beater was going round when the egg shell was added. Some 20 minutes later all the shell was removed. (I hope) All a little bit more time consuming than I had hoped! Cream together the butter and the sugar until light and fluffy. this should take at least 5 minutes with an electric whisk. Add in the eggs one at a time, beating well after each egg is added. I usually add a tablespoon of the flour with the last egg, it stops the mixture curdling. Sieve the flour into the mixture and fold in until fully combined. Divide between the 12 cake cases and bake in the oven for 15minutes or until well risen and springy to touch. Remove immediately from the tin and cool on a cooling rack. I decorated mine with a simple Glace icing which is approximately 5oz icing sugar mixed with a tablespoon of water. Mix this until a thick icing is formed, the consistency should coat the back of a spoon. Pour over your cupcakes and finish with whatever decorations take you fancy. Mine are spotty to go with the Children in need spotty theme!